The River Project, the river research field station at Pier 40, has a collection of many diverse and fascinating aquatic creatures. But one, a recent arrival, is a superstar. Weighing in at 1.3 pounds and just over eight inches long, it is a giant oyster found last month by hard hat divers who are repairing Pier 40, near Houston Street. “This oyster is by far the largest oyster recorded in the Harbor in modern times,” said Cathy Drew, The River Project’s executive director. 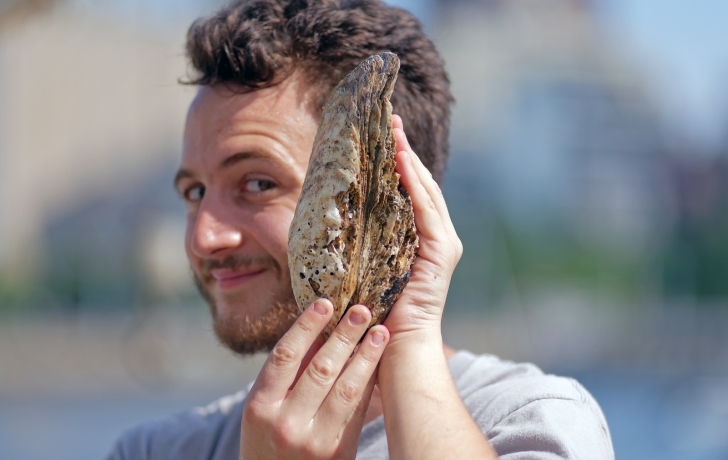 John Waldman, an aquatic conservation biologist and Queens College professor who has seen a picture of the oyster, estimated its age as more than 10 years, and possibly between 15 and 20 years old. Kister pointed out that the oyster over its many years has served as a habitat for “hundreds of other animals.” On one side of the shell are many tiny circles that Kister said indicates the oyster has hosted lots of barnacles, and on the other are holes that he believes were formed by tiny worms.